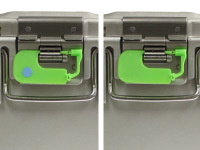 Designed as a seal for closed sterilization containers, the green container lock is offered with or without a sterilization indicator dot and can be positioned on the front side of containers. The lock easily seals and breaks by hand. Simply place arrow through slot of item to be sealed, gently push arrow into locking barrel until it engages locking teeth and push on padlock seal to ensure it has been properly locked. To remove, hook forefinger under locking barrel and pull laterally away from the slot.